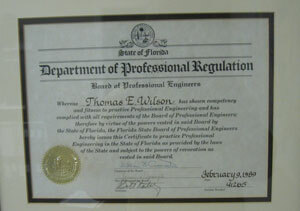 Wilson Engineered Systems is headed by a Florida Professional Engineer (License #41265) and the company is also a State of Florida Authorized Engineering firm (CoA #27783). That sets us apart from most companies providing technical infrastructure. Being engineering based means we have the background and interest to differentiate product capabilities. We all know that if we simply followed manufacturer marketing material we would find all products are the best at what they do and likely all are claimed as low or lowest priced. However, we also know that is never true. Products have a reliability, an efficiency and a price. Rarely, if ever, does a product excel in all three areas. Our engineering experiences helps weed through the hype to achieve the best balance for our clients. We have learned well known manufacturers may be marketing focused and have weak products that present better than they perform. Also, many engineering based manufacturers have great products few people know of. We are paid to know the difference and provide that benefit to you.